An update to Vol. 1, pp. 181–182. 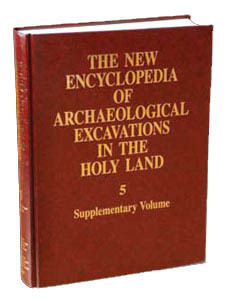 In the excavations conducted at Khirbet el-Beiyudat on behalf of the Staff Officer for Archaeology in Judea and Samaria and directed by H. Hizmi, most of the remains uncovered date to the Early Roman (Herodian) period, with a small number belonging to the Late Roman and Byzantine periods. The Herodian period remains include a monumental tower built of ashlar masonry, a luxurious residence, a way station, and an aqueduct. In the Roman period an army camp was erected on the site, and in the Byzantine period a church was built, with a colored mosaic pavement and five inscriptions in Greek. THE MONUMENTAL ASHLAR TOWER. In the northeast sector of the site, a mound rises to a height of 5 m; below the level of the mound a broad plain extends to the east. On the mount is a tower, which covers an area of 300 sq m and was found standing to a height of 9 m. The foundations of the tower are built of fieldstones roughly dressed on their outer faces. The walls of the tower are 1.2 m wide and consist of two masonry faces with a core of small stones bound with mortar. The outer face is constructed of sandstone ashlars laid as alternating headers and stretchers; the inner face consists of soft local limestone fortified with marl. A coating of thin white plaster bearing traces of red paint is preserved on some of the stones on the outer face. The tower is divided into long, narrow rooms and square-shaped rooms. Two of the rooms cleared had been intentionally filled with a 3-m deposit of local stones.